Nestled on 35 picturesque acres, Fernbrook Park is the perfect place to stay and explore the true essence of the East Texas Pineywoods. Antiques and day trips abound. Reserve your manicured oversized site today. This is one of the parks that we wish we had time to really enjoy. Maybe next trip South! 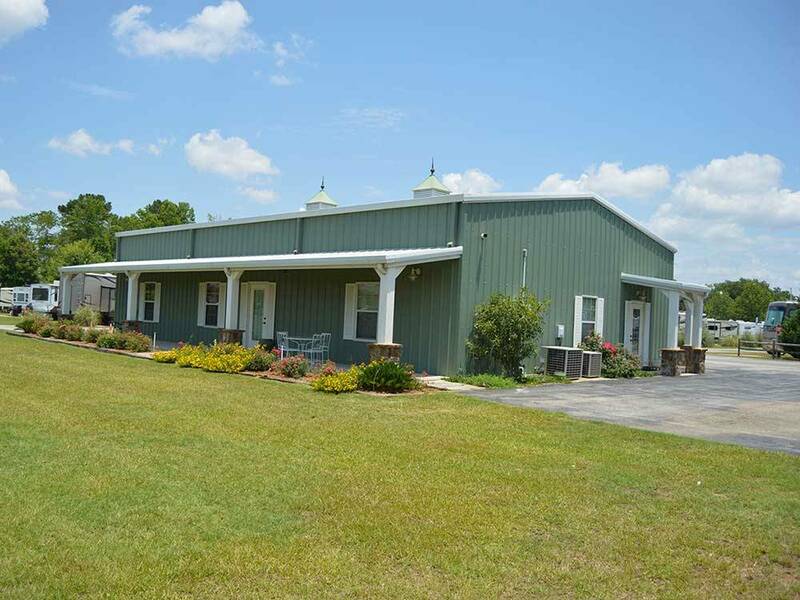 the staff is super helpful site's are paved and level with no need to adjust our trailer for the stay. Roads are paved and landscaping kept up. The park is enjoyable to walk around and has several off road paths to enjoy. Lots of travelers and long term in the park and very quiet with no outside traffic noise. They were very accommodating with us arriving late. Recommend it highly. We stayed for 5 nights. Had to shift the schedule by a day. No problem. Appreciated the individual bathroom/shower rooms. Each room was tiled with a walk-in shower. There are two bathroom/shower buildings on site. Laundry room was large enough that we didn't have to wait for machines. Playground was great for the kids. Seems like the spacing between sites is better than other locations. This place is wonderful, fully reflecting its perfect 10 rating. Office service was very good, paved roads, clean bathrooms, and paved RV sites. They also have high speed internet for movie streaming. There are a lot of long term guests, however, the sites are kept clean of the normal trash. We would stay here again and highly recommend it for others. The only complaint is that they allowed someone to have a blow up Santa in their site. Fernbrook is a very nice park if you're looking for a place to relax. The amenities are not the best I've ever seen but they are adequate. The check-in process was quick and easy! The lady in the office was very nice. We try to stop at RV parks with a fenced dog area. There is one here but the grass needed mowed getting there and inside the fenced area as well. The owners are in the process of adding deluxe sites so there was ongoing construction that was not intrusive. This was an overnight stop for us so we really didn't make use of frisbee golf, horseshoe pit, or basketball court. We went out of our way to try this out and would go back again if it was on our route. We only stayed one night here but it left us with a good impression. Found it in the good Sam book. reviews are good in determining a place to stay. This is a nice park. lots of grass. When the trees come in about 20 years and if they maintain it like it is today, this will be one premier park. All concrete slabs, nice and level. easy getting in and out. pool was real nice. Shower area in main building was great. Laundry room was great. We would stay here again. Attentive staff - we were greeted as expected and taken to our site Good internet connection Level concrete sites Good water pressure Nice shower facilities Basic pool setup - no frills This was a convenient one-night stay on our way north. A bit pricey for the amenities offered, but it was a nice park. Very poor signage. Coming in from the south, the sign on the park appears after the entrance. We had to drive another couple of miles before we could turn around and reenter. They need to add better signage on the south entrance into the park. I reviewed the Good Sam site and found the Fernbrook Park near Longview. The park received high ratings with great reviews and was away from highway noise. I made reservations two days ahead of time and requested a pull through site because we were pulling a car with a tow dolly. The office was ready and had our reservation so check in went fast. The park was spotless and well maintained. We're new to the RV life but I can say this is the nicest park we stayed at so far. Found the staff very competent and friendly and pleasant. Facilities were very clean and well maintained. 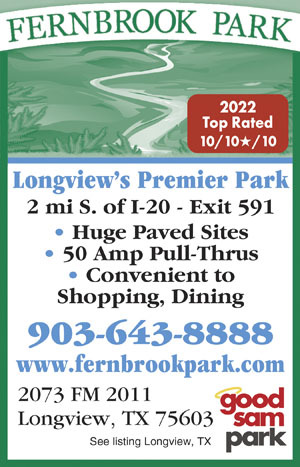 Located very close to I20 for easy access to Longview and Kilgore. Will be staying there in the future. Very happy experience. DO NOT STAY HERE. The owner gives "no sh" about you. We arrived to find the office closed. We were there at 5:45 p.m. We called the on site manager number, finally at 7 p.m. got an answer. She knew nothing. We needed wifi code. She had none and no idea who or how to get one. I insisted that she call the owner. She did and called back with basically tough, too bad so sad. The bathrooms were dirty. The toilet clogged. The dreaded kind where when the one next door flushes it backs up into yours. The camper next to me tried for hours to get the on site manager on the phone for the same reasons as we were trying. IT is a good thing there was no need for an ambulance, the on site manager could not likely give directions. This place cares very little about one night visitors as it is filled nearly to capacity with long time campers and they give no sh... If you are looking for a backwoods, do it yourself and fend for yourself experience, stop on in. But if you want value for your money and some service and response, keep on driving, this place is NOT for you. Overall appearance of park is flat and almost commercial in my view. Lots are close together but ample. All asphalt and very level. Laundry facility was fantastic. Restrooms very clean and setup very nicely. Easy hookups. Nice clean park. Recommend anytime. Bathrooms were excellent. Park excellent shape. Pull in sites cement pads. Water, elect, and sewer connections excellent. Average RV spacing. Very nice pool. Staff was courteous, friendly, and knowledgeable. Very nice place - wish we had time to stay longer. Off the main travel so it was quiet most the time.